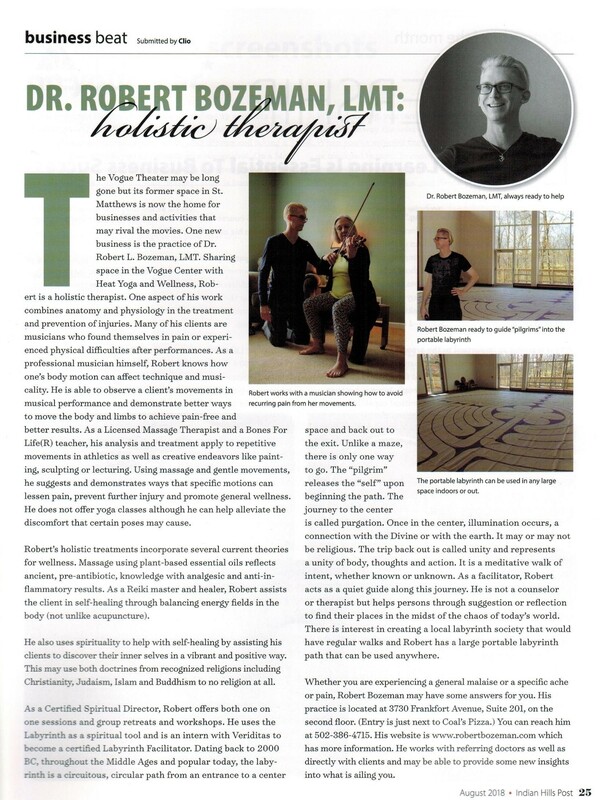 Dr. Robert L. Bozeman is a Holistic Practitioner in Louisville, Kentucky. Robert holds the Doctor of Musical Arts degree in performance from the University of Cincinnati-College Conservatory of Music. He is a Licensed Massage Therapist and a graduate of Advanced Massage Therapeutics in Louisville. Having been involved in the healing arts for twenty years as a Reiki Master, he became a Bones for Life teacher* in 2015 and a Certified Spiritual Director in 2018. The focus of his massage and healing practice is on injury prevention and treatment. Many of his clients are professional musicians. He continues to concertize as a solo artist, is a published writer on life-long learning, and teaches master classes and workshops in addition to his private practice. *Bones for Life was created by Ruthy Alon, a Feldenkreis Method Practitioner and Senior Trainer. These gentle movements assist the client in better alignment/posture, ease of movement, and less painful living. Read practice philosophy & client testimonials.